Now that the state Office of Elections has taken over Hawaii County’s general election, the Hawaii County Council wants a full investigation into what went wrong in the primary election that ultimately led to the state taking back its authority. West Hawaii Today. 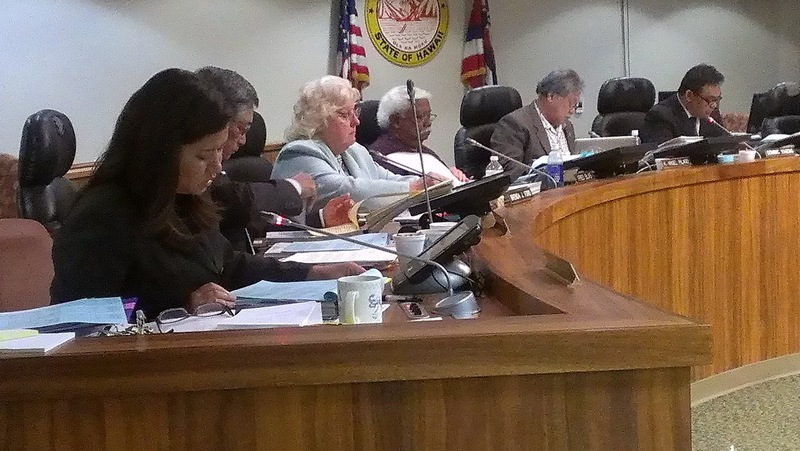 A day after an unprecedented move by the state to take over elections on the Big Island the county's chair is biting back and defending embattled County Clerk Jamae Kawauchi. KITV4. Hawaii County Clerk Jamae Kawauchi says she will meet with Scott Nago, the state's chief elections officer and other officials at the state attorney general's office. Associated Press. A day after the state said it would take over Hawaii county's election, the county clerk has called for a meeting with the state attorney general. KHON2. Former Gov. Linda Lingle put a stop to a multi-million tax case against Expedia.com and a dozen other online travel firms after meeting behind close-doors with the companies, Lingle's former tax director said in sworn testimony. Hawaii News Now. Gov. Neil Abercrombie’s administration is moving decisively toward importing liquefied natural gas for Hawaii’s electricity needs. But this doesn’t mean state officials are easing up on the push for renewable energy. Civil Beat. A highly anticipated program aimed at speeding up dozens of renewable energy projects in Hawaii is rife with problems including solar companies jockeying for advantage in order to tap into an increasingly lucrative market. Civil Beat. The Hawaii State Energy Office has released a guidebook for commercial properties interested in installing electric vehicle charging stations. Pacific Business News. Hawaii's beef market is backward. Nearly all the beef eaten here — 95 percent — arrives packaged on container ships from the U.S. mainland. At the same time, Hawaii cattle ranchers ship 40,000 live cattle each year to California, Kansas and other states, while just 4,000 are slaughtered for meat sales in Hawaii. Associated Press. State roundup for October 4. Associated Press. Mayoral candidates Ben Cayetano and Kirk Caldwell re-staked their positions on the city's $5.26 billion rail project in their first head-to-head mayoral election debate Tuesday night on KITV. Star-Advertiser. Forget about third-party attack ads, Honolulu mayoral candidate Kirk Caldwell had his own barbs for former governor Ben Cayetano during their first televised debate since the Aug. 11 primary. Civil Beat. For the first time since the August primary election, both candidate for Honolulu mayor faced off in a debate Wednesday night. KITV4. Former Gov. Ben Cayetano's campaign team revised the cost of the transit plan he unveiled last week, increasing the projected cost to $1.5 billion from $1.2 billion. Star-Advertiser. The independent engineering consultant required by the Federal Transit Administration to perform due diligence on Honolulu rail says in a new report that the project's cost estimate, risk and contingency are all reasonable and worthy of a federal funding guarantee. Civil Beat. The Honolulu City Council gave final approval Wednesday to Kamehameha Schools' plan to make improvements to Haleiwa town, despite lingering concerns about traffic in the area. Star-Advertiser. Another alleged victim of sexual abuse at the hands of a Catholic priest is taking advantage of a Hawaii law that opens a two-year window to file civil claims in cases where the statute of limitations has expired. Star-Advertiser. Investigation Continues into Company that Defrauded University of Hawaii of $200,000. Hawaii Reporter. Talks are still going well between Hawaii Pacific University and Aloha Tower Marketplace. Hawaii News Now. The Hawaii County Council voted unanimously Wednesday to urge the abolishment of the Public Land Development Corp., formed by the state Legislature in 2011 to foster development of public lands. Tribune-Herald. The County Council today unanimously approved a resolution asking the state Legislature to repeal Act 55, the law that created the controversial Public Land Development Corp. Big Island Now. A proposed ban on geothermal drilling at night, introduced in response to recent drilling at Puna Geothermal Venture, passed its first reading Wednesday. Tribune-Herald. The long-awaited groundbreaking for a $18.1 million gym and community shelter was attended Wednesday by about 200 people, including Ka‘u High students, Gov. Neil Abercrombie, Mayor Billy Kenoi, and Ka‘u’s representatives in the state Senate, state House and the County Council. Tribune-Herald. A groundbreaking ceremony Wednesday kicked off the construction process of the 83 homes in the state Department of Hawaiian Home Lands’ Lalamilo subdivision in Waimea. West Hawaii Today. Kona Community Hospital has hired a consultant to begin preplanning a replacement for the Kealakekua facility. West Hawaii Today. The state Department of Health has completed the first phase of a study on the health effects of sugar cane burning on Maui, and, while the preliminary results hint at people suffering ill effects downwind of cane burning, the study won't be complete until Maui Memorial Medical Center and island health clinics allow researchers access to their records, said Dr. Lorrin Pang of the state Department of Health. Maui News. Maui County has forked over $37,500 to support the hunting of pesky axis deer on private property. Star-Advertiser. A new group is now formally organized to control Axis deer in Maui County. Maui Now. The Kaua‘i County Council on Wednesday reached a majority vote on a decision that would allow a new youth diversion program to go forward. Garden Island. The leak from a force main was confirmed to be the cause of Tuesday’s sewage spill in Hanapepe, according to a County of Kaua‘i news release. Garden Island. A large light bulb that might be debris from the 2011 Japanese tsunami has been found on the south shore of Molokai. Star-Advertiser. A skilled group of Hawaiian masons from parks throughout Hawaii Island joined park staff at Kalaupapa National Historic Park (NHP) to repair deteriorating drystack walls in the settlement and at Kahaloko Cemetery. Kalaupapa NHP has hosted the masons for rock wall repair within the park for the past five years. Molokai Dispatch.